Welcome to Pediatric Orthopedic Associates, P.A. We're proud to provide the area's finest available pediatric orthopedic care in the heart of Middlesex and Monmouth counties. Stay up-to-date with the latest news and media from Pediatric Orthopedic Associates by following us on our social networks. 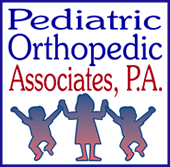 Pediatric Orthopedic Associates specializes in fracture care, sports medicine and scoliosis evaluation and treatment. We are pleased that you have chosen Pediatric Orthopedic Associates for your care, and we take this opportunity to provide you with information that may be helpful. We believe communication is essential and that the more information you have about our practice, the easier it will be for us to work together to meet your child's health-care needs. Dr. Deidra Bielicka joins Pediatric Orthopedic Associates adding her expertise in Pediatric Congenital and Traumatic Hand and Upper Extremity problems. We are proud to welcome Dr Bielicka home to NJ and look forward to what she will contribute to the care of children in our region.